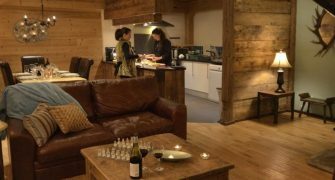 Venture Ski’s self-catered chalets in Sainte Foy are ideal for families and small groups. 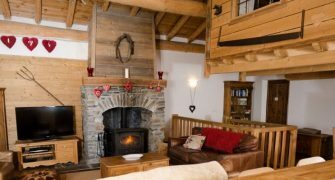 Each chalet features a beautiful lounge, well-appointed kitchen, log fire and great views, with easy access to Sainte Foy resort and facilities. Our spa and swimming pool is accessed just a few metres from the door. In the peaceful Sainte Foy resort area of La Bataillette, our self-catered chalets and apartments are a five-minute walk from the resort centre where there are shops, local restaurants and bars, ski schools, nursery slopes and the main ski lift. Even closer to hand is the Black Diamond Restaurant and Apres-ski bar. 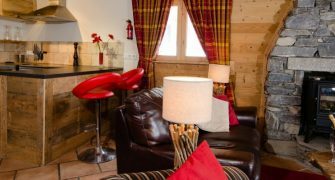 All our chalets and apartments are ski-in, located at the bottom of La Bataillette piste. Although only a couple of minutes walk, there is a free navette bus to get you back onto the ski lifts if you prefer. The chalets are close to creche and childcare facilities. Babysitting services are also available. If you need a little help with the catering, we can arrange a drop-off service for fresh breakfast supplies each day (croissants, bread, milk, fruit juices). Similarly, you are just a few metres from our top-rated Black Diamond Lodge Restaurant, where you can book in for dinner on an ad-hoc basis, or pre-book at a fixed price prior to your holiday to be assured of a special treat in the evenings. The apres-ski bar is also nearby at the bottom of the piste as you ski in, with some fun afternoons of live music, and on other nights a cosy place to relax with a fireside beer or glass of wine. Fine cotton linen, fluffy towels. Hypoallergenic duvets & pillows. Complimentary toiletries by THE WHITE COMPANY including shampoo, soaps & hydration cream. Free wireless internet access in all our chalets. Use of our spa/swimming pool, sauna and hot tub facility. Access to facilities such as crèche, resort hosts/concierge service, on-site massage therapist. The nearby Black Diamond Lodge Bar and Restaurant with regular après-ski live music. Our ski in chalets are in Sainte Foy (2620m top chair lift), French Alps, and they enjoy a position near the nursery slopes/ski school. There are also bars, shops and restaurants within a couple of minutes’ walk from the chalet door.